JS Connor are celebrating 100th company anniversary! John S. Connor, Inc. is pleased and proud to announce it is preparing to celebrate its 100th anniversary. Founded in 1917 by its namesake, the company provides a variety of transport and logistics services to a many different industries and government agencies. Services include freight forwarding by sea, air and truck as well as customs clearance services, vessel agency and a variety of additional solutions to meet the specific needs of its clients. John Connor began the company in Baltimore with a $300 loan from his mother three months after obtaining his customs brokers license. Since then his brother and two sons succeeded him and built the company to one of the largest of its kind in the Mid-Atlantic region. The current president is Lee Connor, grandson of the founder. Another grandson, Butch Connor is VP of Ocean Freight. A fourth generation is also working in the business. 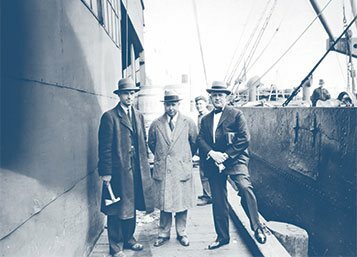 In the beginning the company focused on customs clearance business in the port of Baltimore. Today it has a half dozen offices in the region and offers world-wide coverage for the needs of its clients through a tight network of agent relationships throughout the world. Still headquartered in Baltimore but with a global reach to allow it to provide comprehensive door to door services for those clients requiring this. Freight forwarders and customs brokers play a significant role in international commerce. Often they are the lynch pin which ties together all the parties required to move cargo from point A to point B. From booking the space on the ship or plane, to ensuring all details and documentation comply with government regulations, to coordinating the movement and release of cargo with terminal operators, shipping and airlines and Customs and Border Protection as well as many other government agencies, depending on the type of product and regulatory requirements. Freight does not move without the crucial, often invisible actions of the freight forwarders and customs brokers behind the scenes. The company will be holding a special celebration event in September to commemorate the occasion. Posted in News and tagged 100 years, anniversary, baltimore, js connor.